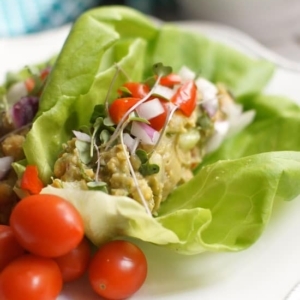 An easy vegan dish that is reminiscent of traditional egg salad. If using canned chickpeas, rinse and drain them well. In a large bowl, combine the avocado and chickpeas, and roughly mash with a fork to combine. Add in the Dijon mustard, lemon juice, salt, red onion, red pepper, cucumber, and dill, then stir well to combine. Adjust the seasonings to taste, then serve however you like. It makes a delicious salad topper or sandwich filling! Store any leftovers in a sealed container in the fridge for up to 3 days.